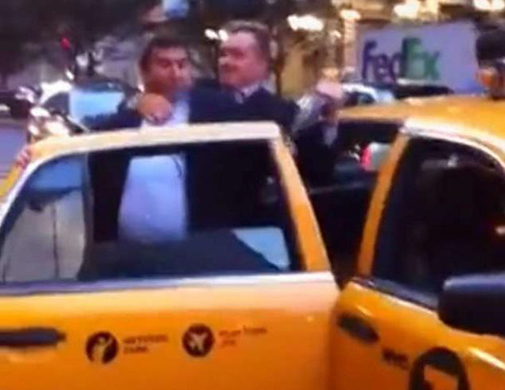 (Scroll down for video) Two grown businessmen in New York got into a nasty fight over a taxi, which was all caught on video. New Yorkers are seen worldwide as impatient, aggressive and notoriously short-tempered. In just twenty seconds, two businessmen have reinforced that reputation and quickly validated the stereotype of the residents of the Big Apple. Men dressed in suits embarrassingly accomplished this feat when they were captured on video getting into a fight over a taxi in Manhattan's financial district. Apparently, without knowing it, the fight was all caught on camera by a passerby who promptly posted it on YouTube. In the video, one man is seen giving the first push to the other. They continue barge at each other, competing for the taxi, apparently unaware of a young woman who has to quickly escape from getting in between them. The men continue to fight, as both try to get into the cab and one succeeds in getting the other in a head lock. At this point, the driver comes out of his car and tries in vain to stop the fight. One man finally gets into the cab, but not before receiving a blow to the head. Defeated, the second man slams the door shut. The men have not been named and shamed, but a YouTube user compared them with Tweedledee and Tweedledum.